Having just completed a major life event (hint: "I do. "), the run-up to and immediate aftermath of which sapped up any and all blogging/writing time I had, I'm super excited to return to The New Dork Review of Books. I missed it! I missed all of you! During the last few months while the blog has been inactive, I haven't stopped reading. I just stopped, temporarily, writing about what I read. So let's play some catch-up. Here are some very short reviews of books I read during the blog's hiatus. Enjoy! 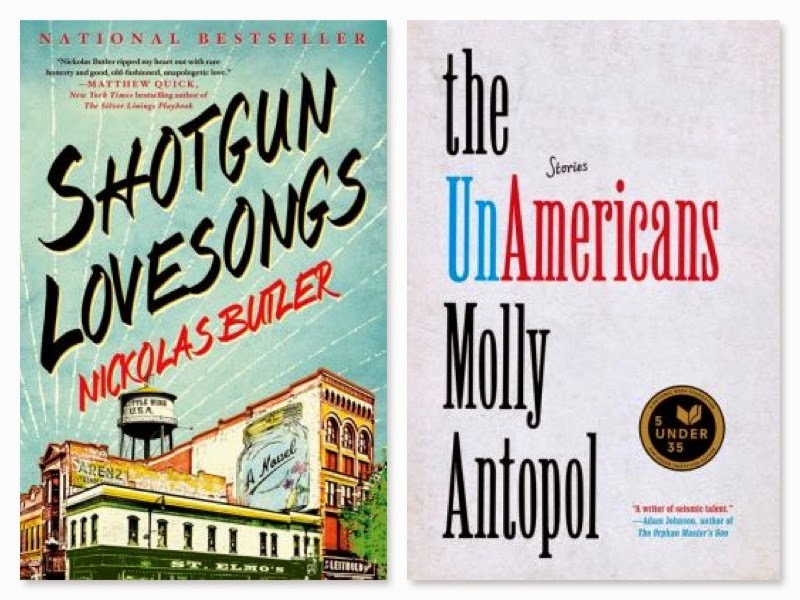 Shotgun Lovesongs, by Nickolas Butler — Sometimes, you read a novel at just the right time in your life, and it resonates immensely. That was the case with Butler's debut. But even if this hadn't been the perfect novel for the perfect time, it's still an incredibly good read — my favorite of the year so far. It's about a group of childhood friends who return to their small-town Wisconsin homes. It's told from the varying perspectives of the characters, as we see how their pasts inform their present relationships to each other and others. It's a novel about loyalty and love, and it's effing fantastic. Highly, highly recommended! The Unamericans, by Molly Antopol— This is the best short story collection I've read since George Saunders' Tenth of December. Not a single dud in the bunch, and several that have stayed with me and that I still think about constantly — most notably, the story "Minor Heroics," about an Israeli kid who saves his brother after a tractor accident and develops a crush on his brother's girlfriend. Sharp Objects, by Gillian Flynn —Flynn's debut novel is, if possible, even more disturbing than the novel that made her a household name. Sharp Objects is about an early 30s Chicago journalist named Camille who returns to her small Missouri hometown to write a story on the murders of two girls. Camille has quite the past of her own — her younger sister died tragically, and Camille dealt with that loss by turning to cutting. She's scarred just about every inch of her body with cuts of words, and what she finds about the girls' murders may scar her even more deeply. This is a short, immensely engrossing read. Nine Inches: Stories, by Tom Perrotta — If you're gearing up to watch the HBO series based on Perrotta's novel The Leftovers, this 2013 collection of 10 short stories is a great appetizer. Perrotta manages to make the mundane fascinating — a junior high dance, for instance, where nine inches (also, no doubt, a fairly unsubtle but highly amusing double-entendre) of space is required between dancers. These stories are straightforward and don't require much mental acuity to keep pace, but they're always entertaining and they all fit together well in this collection. The Noble Hustle, by Colson Whitehead — This book is a chronicle of Whitehead's experience at the World Series of Poker — told with intelligence, wit, and no small amount of self-deprecation. Oh, and jokes. So many jokes. It's a quick read that really makes you want to get out the chips and try your hand. Hawaii, by James Michener —I've had this on the shelf for a solid 15 years. I finally read it before the honeymoon in Maui. As with most of Michener's fiction, it's long, detailed, and covers several millenia. But I learned a ton about my favorite vacation spot — from sugarcane to leper colonies, and from fire gods to the Plague. Fascinating read! Books I Didn't Like ... But You Might? To Rise Again at a Decent Hour, by Joshua Ferris —An atheist dentist has his identity stolen, and learns he may or may not be part of an ancient sect called the Ulms. Why are we here? What's the point of it all? Why is Facebook so annoying? You get to think about these questions and more in this good-premise-but-poor-delivery novel. The Flame Alphabet, by Ben Marcus — Sooner or later, Marcus is going to deliver a mind-blowingly good novel that makes him a David Mitchell-esque superstar. The guy is an immensely talented writer. Unfortunately, this novel about what happens when the sounds of kids' voices cause their parents to be sick, isn't it. It's rather original, but a bit of a slog. For sure - read it on the plane and the beach. Couldn't put it down. Nothing creepier than evil, preternaturally mature children. I like that Michener made your list. I read something by him a few years ago - i can't remember what- but i just remember that it felt so dates. But it did make me laugh (unintentionally). The UnAmericans is so good ... I had to really force myself to take it slow, one story in a sitting. Can't wait for an Antopol novel! I listened to Shotgun Lovesongs and also loved it! Although I live in Northern Wisconsin so that may have helped! Nice! I went to school in Milwaukee, but grew up in a small midwest town, so it resonated with me as well. But also, it's just really good! Welcome back & Congrats on getting married!!! I'm glad you read the Molly Antopol stories as I have been curious about this collection and heard such high praise about it. I'll have to check it out. cheers. Thanks! Antopol is really good - it's easy to tell that this is just the start for her. Can't wait to see what she's up to next. I almost picked up Shotgun Lovesongs from Waterstones last week. Wish I had now. Adding it to my summer reading list. Woohoo! Let me know what you think - hope you like it too. Shotgun Lovesongs was bought a while ago, glad to see it continues to impress people. The Ferris book, not even going to attempt. I hated The Unnamed and the mixed reviews for this new one do not make me want to give him another try. I'm sad about Flame Alphabet, that one has been buzzing around me for a long time. I might still try it, you basically liked his short stories right, so it was not the writing but the story? Don't know quite what to say about Marcus, other than it's clear he's supremely talented, so, yes, to answer your question, I loved his writing, but the story was a bit...off. I'm not sure I know why it bugged me, it just seemed maybe a little too much. Congratulations on your marriage! Hope you had a wonderful time in Maui. I used to read a lot of James A. Michener at one time. I was never a huge fan of the writing, but I loved the way his books immersed you in another time or place. They were great geography/history lessons, and a wonderful escape, which sometimes is exactly what you need a book to be. I haven't thought of Mitchener in years but I think I'll find one of his novels and make it part of my summer reading. Thanks! Yeah, Michener's writing is pretty sterile. HAWAII is the first I'd read by him in years, too. And I really did enjoy it. I really, really liked these stories. They take place in a variety of physical locations, but they all happen in Jewish World. The characters and situations felt very real to me. The stories do tend to have sort of the same flavor, but the author is young and I hope she'll develop her voice. If you're Jewish, read this one.